QUINT: "I feel that a lot of artists are looking right now to present something new and some sort of unbeaten path which is very difficult to find. With Chaplin, you know I do feel that I have something new, something that people have not heard about." AZNAVOORIAN: "Yes, and it's something that's always been there. That's what I think that's been such an incredible discovery is just redefining what's always been there for the audiences." 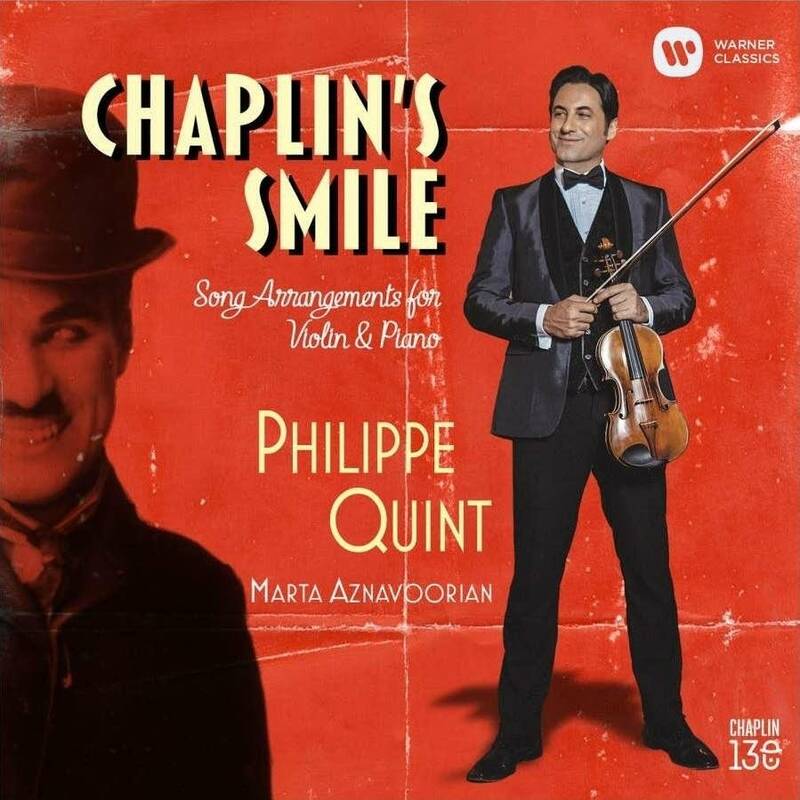 Violinist Philippe Quint and pianist Marta Aznavoorian have spent the past three years unearthing the music of silent-film star and composer Charlie Chaplin. Their new recording of these collected works is titled Chaplin's Smile. QUINT: "Never in a million years I thought that I would be recording music of Charlie Chaplin, because it just was not by any means a fact to anybody that he was a prolific composer. Not just someone that wrote a few songs, but he was the person behind the soundtracks. "I stumbled upon a song called 'Smile' on YouTube. And this was an arrangement that was performed by Gidon Kremer, I believe. And after listening to this arrangement, I thought to myself that I would love to have my own arrangement of this song." I want to ask you about Joshua Bell's appearance on this recording. I know you guys are friends. QUINT: "When we brought the project to Warner Classics, they actually asked me if there was a guest artist that I would like to invite to complete the CD, and of course this was a no-brainer. I immediately suggested Josh, and when I spoke with Josh, he was also quite fascinated about the project — that Chaplin was a composer, and he knew about 'Smile,' that Chaplin wrote it, and we discussed what other song could work well as a duet for two violins and piano. And it was 'Mandolin Serenade,' which is from another Chaplin film called A King in New York." Marta, what was your reaction when Philippe first came to you asking you to be part of this project? AZNAVOORIAN: "I love performing it, I love being part of the creative process, and it's just been an incredible journey." QUINT: "And it was not always smelling the flowers." AZNAVOORIAN: "No, we had a few drag out arguments about — which is, you know we've been working together for 10 years, so we were very comfortable with each other, we respect each other, yet we have no problems raising our voices and making our opinions matter over the other." What did you learn about Charlie Chaplin? Because I know he didn't read music. What else was unique about Chaplin as a musician and a composer? QUINT: "He could not read the music. This is absolutely true. But he had such a versatile knowledge of classical music and what he wanted for his films and for the scenes he was incredibly precise. He would come into the studio and he would hum a little melody, and he would say that this one, I want to sound like Chopin. This one I want to sound like Rachmaninoff. This one I want to sound like Debussy,and it just went on and on." AZNAVOORIAN: "You know so much was involved in just a simplicity for Chaplin, so much pathos, so much pain. He was quoted as saying, you know, comedy is never far from tragedy. And somehow, he can exhibit this in a melody. You know we're listening to 'Smile,' the song 'Smile,' and yet we're crying. You know I really admire that dichotomy of tragedy and humor in life. For me that is a valuable project." You can enter for a chance to win a copy of this week's featured CD on New Classical Tracks. Winners will be drawn at random. Be sure to enter by 9 a.m. central on Wednesday, April 24, 2019.